The last time we saw these shelves in my Fall tour, I was enjoying fresh greens and blues as you can see below. My love affair with these earthy neutrals began when I brought home vintage amber glasses which I’ve now used in so many tablescapes, including my amber and aqua Thanksgiving table. They just catch the light beautifully and make me happy! 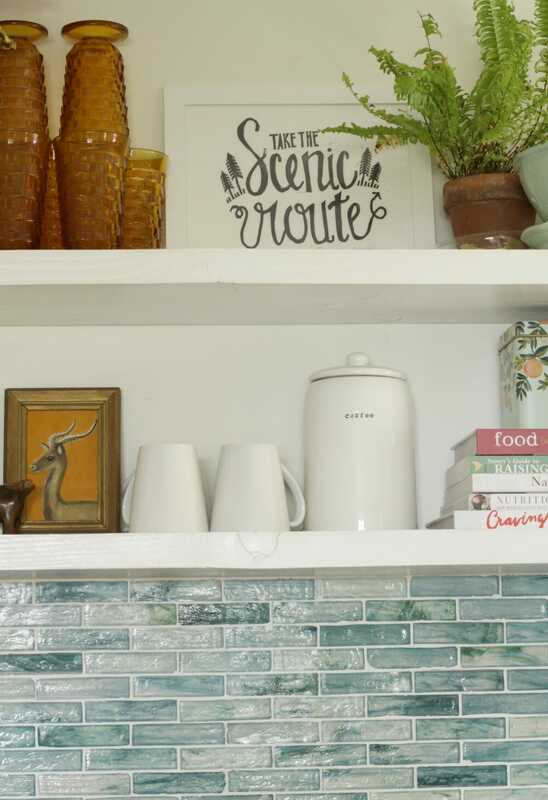 After I brought them home, I didn’t want to put them away, so I decided to add them to my kitchen shelves, but that required a restyle as they didn’t fit in with everything else, and I wanted a cohesive look. 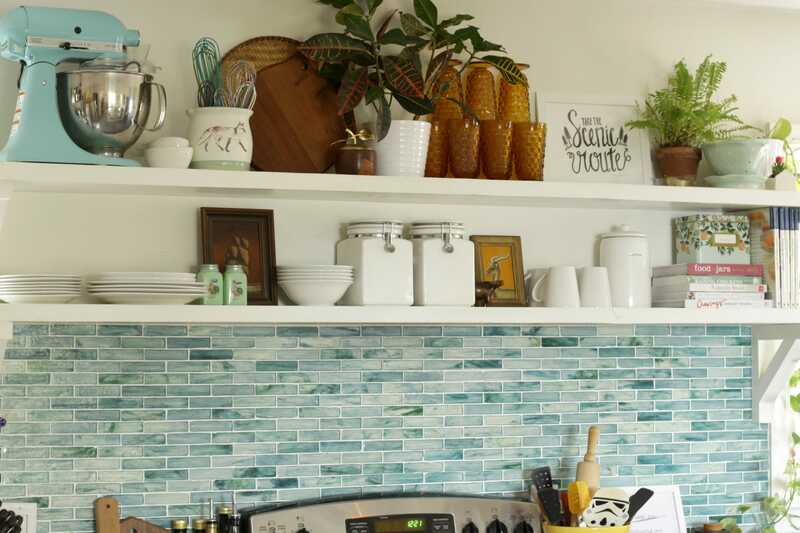 As you can see, we have a boldly colored aqua backsplash, but we have butcher block countertops that add warmth so I knew I could make these glasses work. 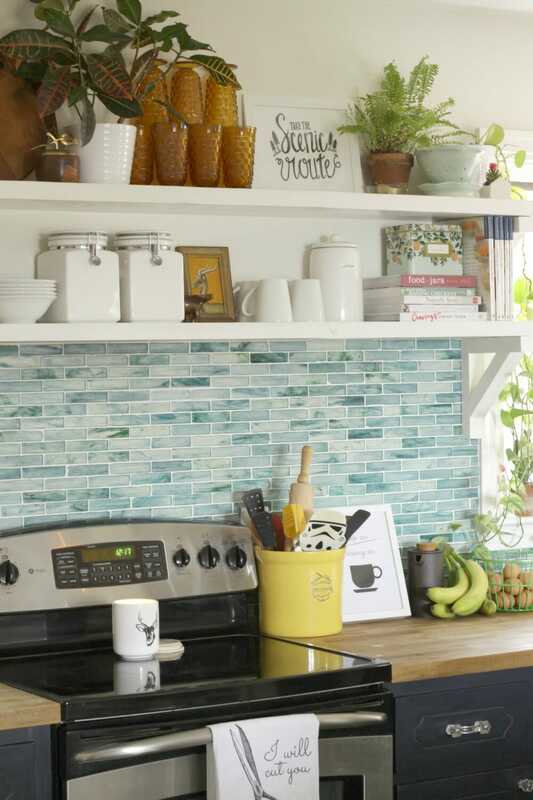 But with the existing greens and blues in the backsplash, I needed to make sure that I carried those colors throughout the shelving also so that it all fit together. On the left side, my aqua kitchen aid mixer stayed to maintain the aqua balance. I added a vintage flat basket as well as a vintage round cutting board and a vintage brass topped wooden apple container that holds our chalk. I recently dismantled my dining room gallery wall, and had a cute little vintage sailboat picture in earth tones that fit perfectly on the lower shelf with my jadeite s&p shakers for a touch of mint. 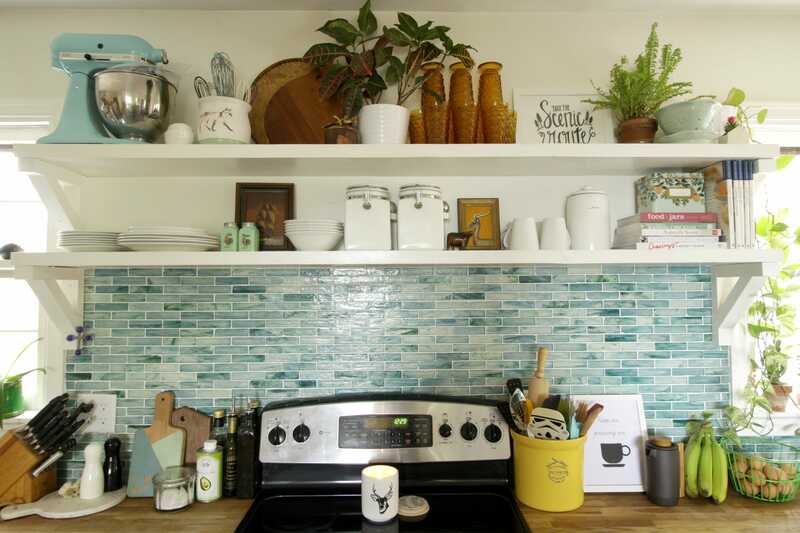 To bring in the existing aqua of the kitchen, I added a handmade pottery colander my parents also gave me for Christmas (similar here), and of course Emmy’s Rifle Paper Co. recipe box. I just love how warm everything feels right now! Of course knowing me, come Spring I will be ready to change it all up again. 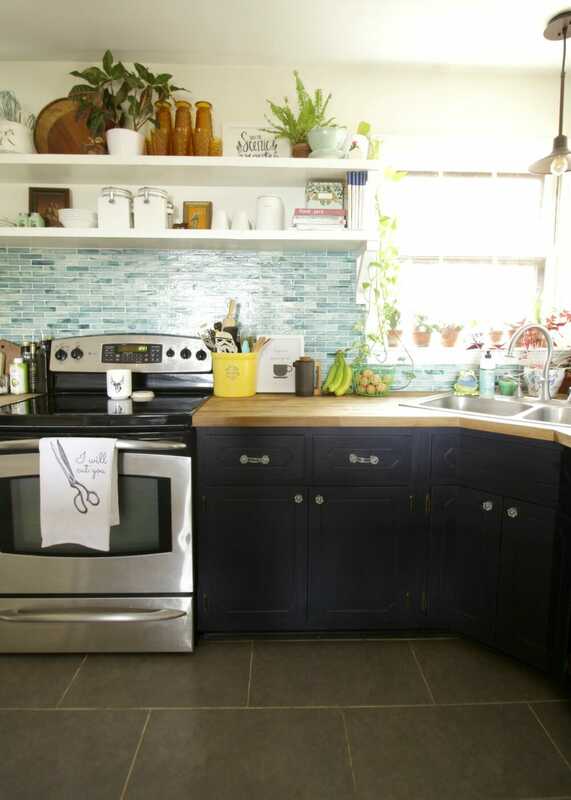 But for now, I will enjoy these earthy vintage vibes in my kitchen. 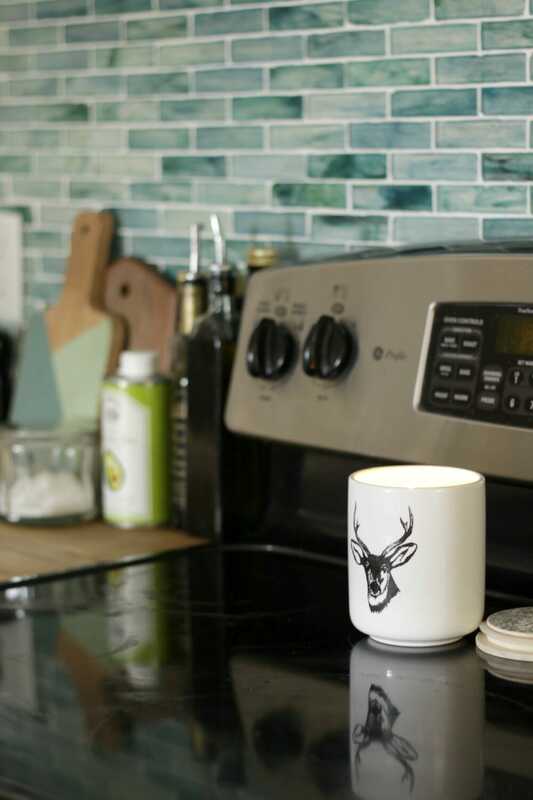 The kitchen is really the heart of our home, and where we spend so much time as a family, so I always want it to be a happy place and a reflection of our family’s personality. 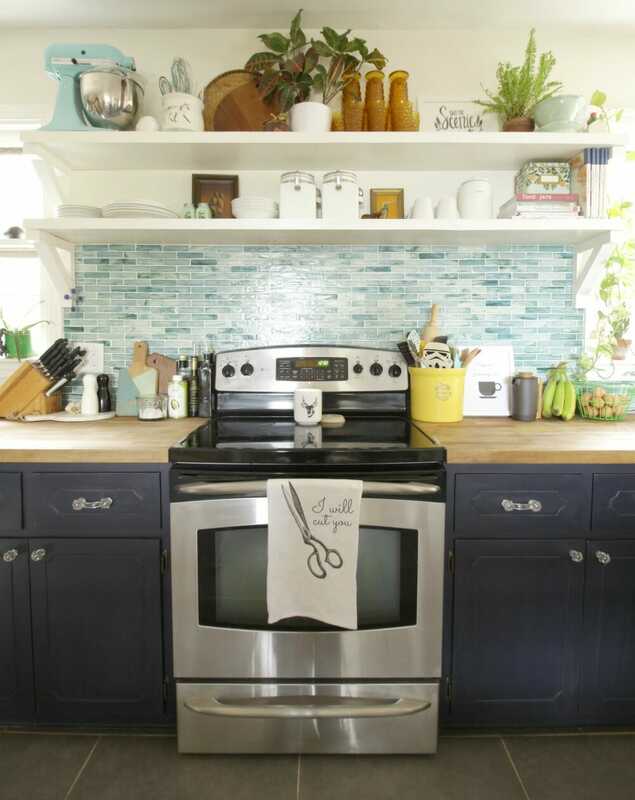 I do want to mention a couple other things you can see above that are not on the shelves, but are things that I love… My color block cutting board is a DIY and we use it all the time. It makes a great hostess gift as well! 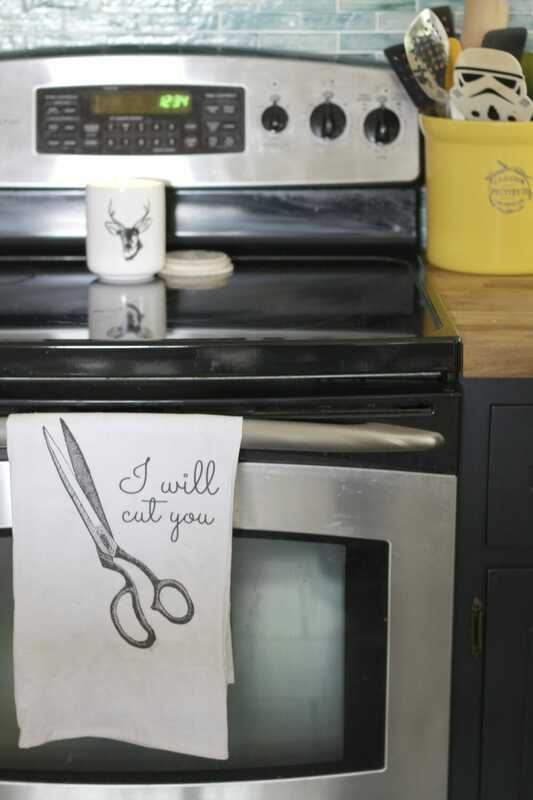 My “I Will Cut You” kitchen towel comes from Twisted Wares. She has no more in the shop, but I found mine last year at Sweet Clover. 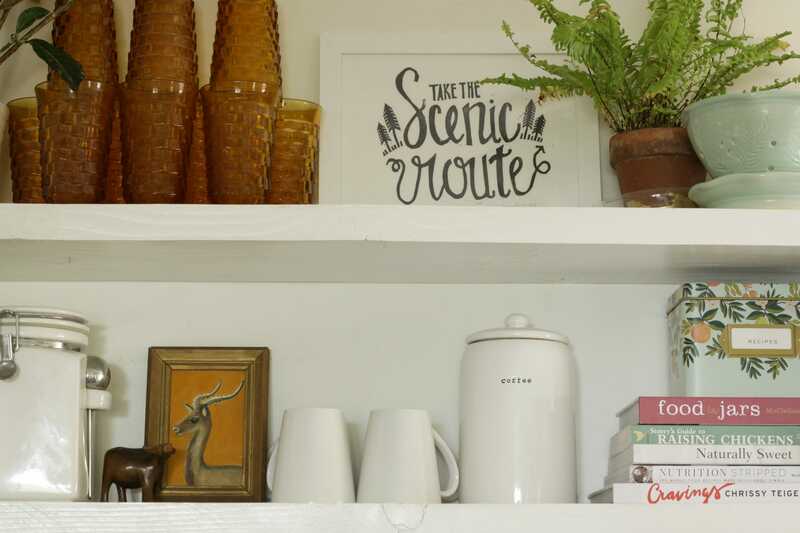 I love the quirky humor it adds to the kitchen. Also, don’t mess with me when I am cooking, K? And on the stove top, I am burning the loveliest seasonal candle I found the other day at Marshall’s. It’s Spiced Rum by DW Home. I searched to try to find it for you and can’t find it anywhere! So hit your local Marshall’s, my friends. It’s adorable and smells awesome. Before I go…. I have a gigantic favor to ask you! If you would be so kind as to take a quick survey and answer just 6 questions…. I am looking to improve this blog. To be honest, blogging in general seems to be in a bit of a slump, and I want to survive! I want to keep bringing you ideas, but I can’t do that unless I have an audience to bring it to. So I’d love your feedback on what you like and what you don’t and where you’d like improvement. Thank you so much! Oh, and don’t forget to enter my Minted giveaway! « How to Choose Family Photo Outfits & Minted Giveaway! You are so good at switching things out. It looks great, as always. I can’t even get my act together to change out my purse for the seasons. 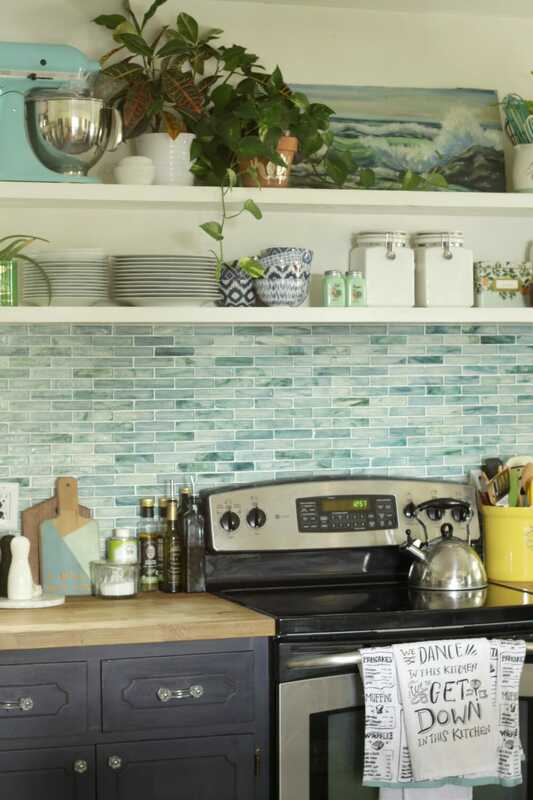 The changes make your tile even prettier! This is a great fall look! I can’t decide which look I like most they are both attractive and fun! Funny, this year I scored on some amber glasses to go with my fall dishes! Glad to see I’m not the only one who likes their look. AND they are so well made. I thoroughly enjoy your posts, style and family! I always love your shelf styling! cute touches! that candle IS fabulous! it smells SOOOO good, too! It looks really great Cassie. 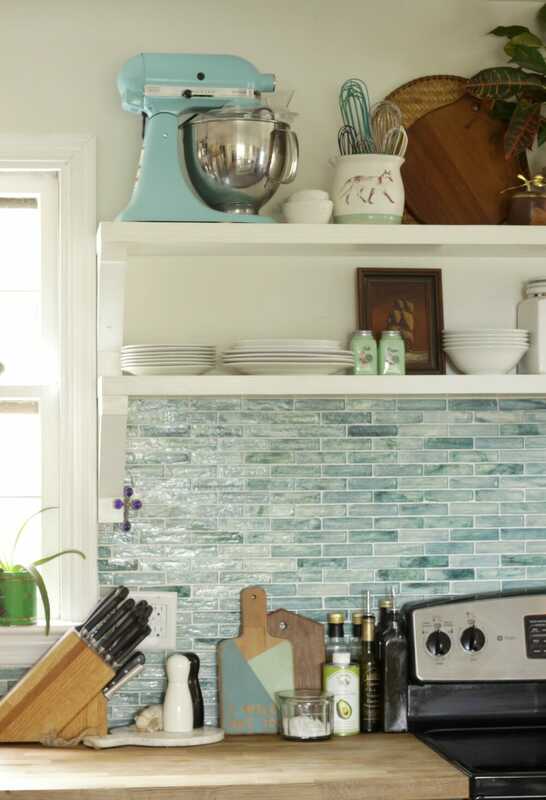 I love those glasses too, I’m on the lookout for some pretty vintage glasses for my kitchen. thank you, tania! i love those glasses so much! they don’t make fun colored glasses like they used to! The amber is so pretty up there on your shelves! Your Thanksgiving table inspired me to pick up the amber plates for mine… Now I’m thinking I need some amber glassware too! aaaaw yay! i just love amber lately! you do! These shelves always looks so pretty Cassie! I love the warmth the amber glass and wood adds. That towel cracks me up!